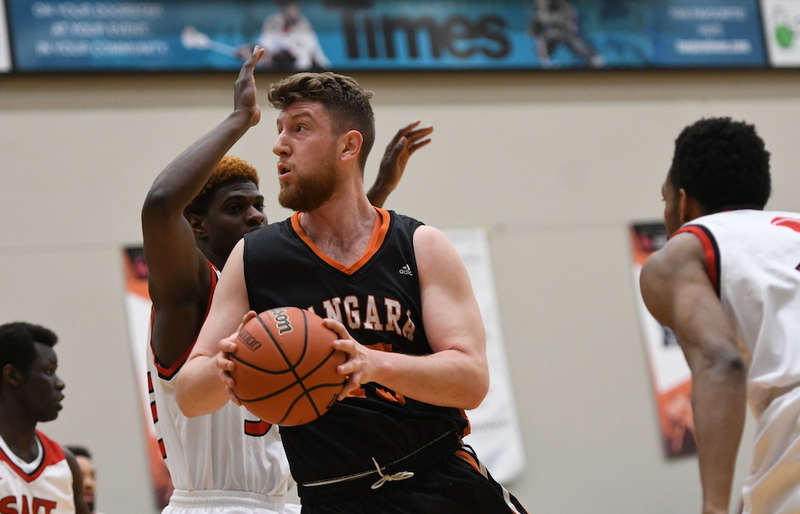 LANGLEY —It wasn’t the finish Vancouver’s host Langara Falcons were hoping for as they wrapped up play here Saturday afternoon as the 2019 CCAA Nationals hit the final day of its three-day run at the Langley Events Centre: An ejection for Langara head coach Paul Eberhardt after he picked up his second technical of the game with just over three minutes remaining en route to a 114-99 loss in the 7th-8th place game to Calgary’s ACAC-champion SAIT Trojans. Yet despite the setback, one which Eberhardt said after the game will signal the start of one of his busiest off-season recruiting efforts yet, the effervescent Falcons’ bench boss felt the three-days of action leading up to Saturday’s championship finale will have done its job in promoting both the PacWest and the CCAA’s exciting brand of basketball to the fans across the Lower Mainland and Fraser Valley. 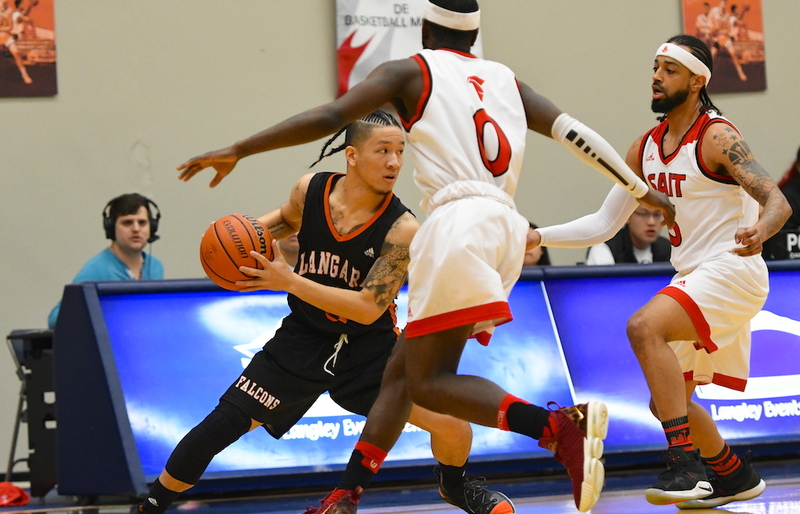 While the tourney was held in Squamish in 2014, when Langara won its first national title since 1999, and has also been contested in Prince George, Kamloops and Abbotsford, it hadn’t been played in the Lower Mainland since 1986 when BCIT was the host school. Expo was here that year, 33 editions of March Madness ago. The Falcons worked hard, yet they didn’t enjoy their finest hour, and their overall lack of athleticism hurt them against the three teams they lost to this week: Charlottetown’s No. 1 Holland Hurricanes, Laval’s Montmorency Nomads and finally, Calgary’s SAIT Trojans. The brightest sign was the play of second-year point guard Royce Sargeant, the 5-foot-9 speedster who was literally able to score at will against his foes. Sargeant, coming back from a broken foot suffered last August in a freak go-karting accident, averaged 26.3 points and 8.3 assists per game. He had 28 points and nine assists Saturday despite being plagued with foul trouble. When he was in the game, the Falcons were a different team, and at one stage in the second half, they had put together a 21-9 run to rally from a 19 points down to just five (79-74) with 3:06 left in the third quarter. 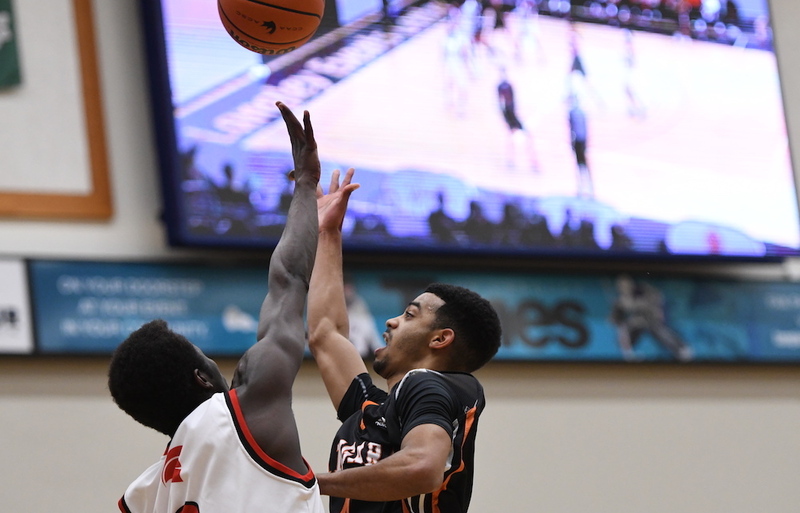 “They just had fits guarding him,” said Eberhardt of a player who looked every bit the CCAA nation’s quickest and most explosive transition guard this week. Yet the head coach is not yet certain that Sargeant will return next season, and the player himself indicated earlier this week that he may make a temporary return to the workforce next season. “Obviously I’d love it if he came back, but it might not be the right fit for him but we’ll wait and see,” said Eberhardt. With a roster of just 10 players this season, and with seniors Drake Downer, Grant Galbraith and Timmie Choi playing their final college games Saturday, Eberhardt says change could be significant. Like the rest of the PacWest, recruiting season beckons. FALCONS NOTES — Upon Eberhardt’s ejection, the scene was somewhat surreal. 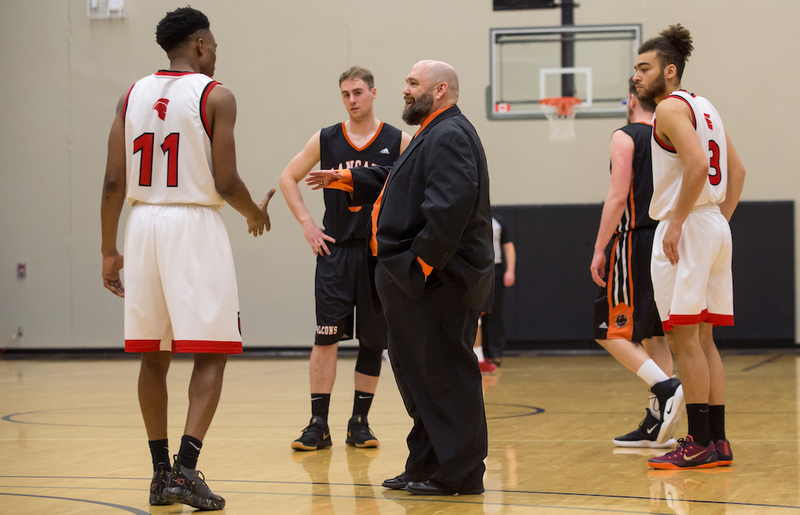 Every member of the SAIT team met him at half court to shake his hand and fans came out of the stands to do the same as he was ushered out of LEC’s South Court gym. 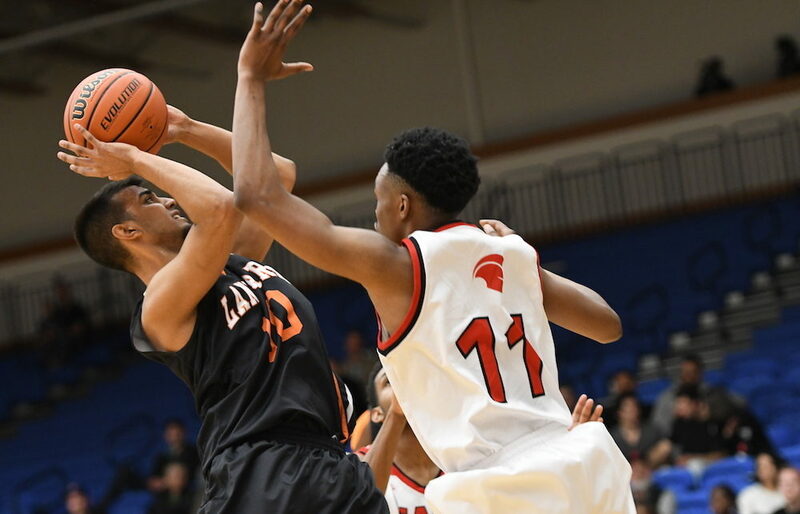 Moeiz Athaya and Antonio Jhuty, key parts of the Langara engine next season, added 20 and 12 points, while another, Tyler Anderson, added six off the bench. Galbraith ended his career with 17 points, nine rebounds and seven assists, while Downer bid farewell behind 14 points and 4-of-8 shooting from distance. Ian Tevis poured home a tourney-high 43 points in the win for SAIT. John Smith added 27, hitting eight treys in the process, while Charlie Conner added 20 points. In a pair of games played Saturday morning, unique bronze-medal semifinal crossover contests, Montmorency defeated Vanier 83-75, and Humber topped Holland 106-97. Vanier and Holland each finished tied for fifth, while Montmorency and Humber were set to battle for third and fourth, in advance of the 7:30 p.m. title tilt between Vancouver Island and Sheridan College.